The T-80 line of MBTs is produced at Omsk Machine-Building Plant. 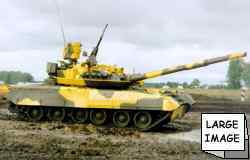 The T-80 (Ob.219sp2) was the first Russian MBT to use a gas-turbine engine, similar in some ways to that of the American M1 Abrams. The original 1,000 hp GTD-1000T, although significantly more powerful than the conventional diesel engines, was much criticized for its noise level, low reliability (especially in conditions of excess heat, dust and so on), much larger fuel consumption (resulting in a smaller operating range) and greater thermal signature. This is one of the reasons (barring the competition between plants) why the T-90 MBT uses the uprated diesel instead of the gas-turbine. However, the reliability problem is being solved; the new 1250 hp GTD-1250 is far more reliable. The large fuel consumption is compensated somewhat by an auxiliary GTA-18 18 kW powerpack. There were also variants of T-80 MBT using a diesel engine, for example T-80UD (Ob.478B) with 1,000 hp 6TD diesel. T-80U MBTs are the most likely candidates to be sold to foreign countries in the nearest years. 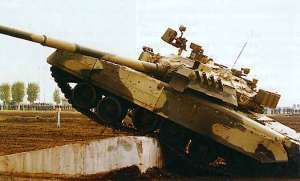 The T-80 tank retains the basic national tank design concept, i.e. the classical layout, where the main armament is arranged within a rotating turret, the propulsion plant and transmission are located in the hull's rear, and the crew members are seated separately: the commander and the gunner sit in the fighting compartment, and the driver in the driver's compartment. 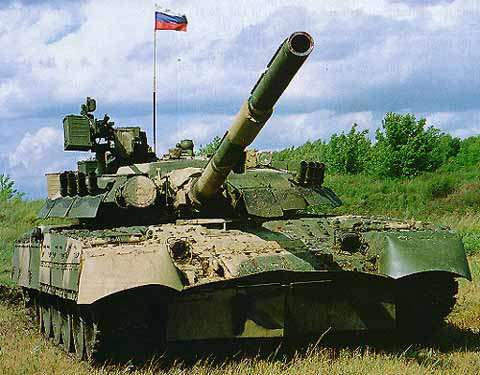 Models most common in the military are the T-80U (Ob.219AS) MBT and the T-80UK command variant that is additionally equipped with the Shtora-1 EOCMDAS, additional radio and navigational equipment and the Ainet equipment for remotely detonating HEF rounds. T-80U(M) is now being fielded as a replacement for T-80U. Both the T-80UK and T-80U(M) are equipped with thermal sights. 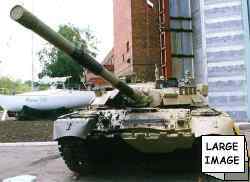 The Kharkov-produced T-80UD, once also rather numerous, is by now completely withdrawn from service as it relies on a foreign production base. Modernization options for the T-80U MBT (the best known example is T-80UM1 "Bars" (Snow leopard)), include the fitting of the Arena prototype APS, Shtora-1 EOCMDAS or its components, upgraded 2A46-M4 maingun, GTD-1250G engine, air conditioner, and so on. It is worth noting, however, that officially the T-80U MBT has lost competition with T-90 and its future in Russian Army is unclear.